Well, we had a lot of fun writing about our first Hour of Devastation pack, so we'll see if this has the potential to become something we do every once in a while. I snagged another pack at the gaming store today, and I'm here to break it down and tell you how each card holds up. This is me speaking after a few Drafts and Sealed parties with friends, and I have a better understanding of the cards now that I've used (or have faced up against) most of them. Even in those two situations, it's on the lower end of the power scale. If you get this in a draft, pass it and don't look back. This can back up a more powerful zombie, but don't let it push you into sticking with the deck. *SPOILERS* This is the only red card in the pack, and it also happens to be one of the best cards. If you get this in your first pack of cards in a draft, you can take it without shame. This card has been getting a bit of hate for being more expensive than both Lighting Bolt and Lightning Strike, but even so, 3 damage for three mana is all you need in Limited to turn the tide of the game. I'd choose this over half of the rares in this set, and I wouldn't feel one ounce of shame doing so. However, it's also the ONLY red card, which isn't what you want to see if you're playing Sealed. I haven't found any use for this in Standard yet. Abrade, Incendiary Flow, Magma Spray, and Shock are all proving to be more useful. Counterspells aren't the most efficient way to remove threats and trade off cards with opponents in Draft and Sealed formats. Still, this one is at least adequate. It shines in the early game, easily stopping any turn-3 spell with zero chance of resistance, and it is unbeatable later in the game if you've loaded your graveyard with a lot of Red or Blue spells. 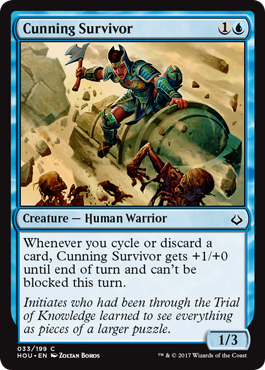 The cycling, allowing you to draw a card if you choose to discard it, also helps redeem its value if you don't find a use for it. The counter easily fails in games where you play safe and keep cards out of the graveyard. Decks that are heavy on creatures and light on removal spells like Open Fire don't really want this. This might be useful in Standard in with the cycling, but I would only ever put it in a spells heavy control deck. 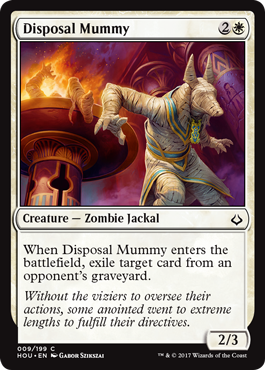 Even then, I'd rather run Censor from back in Amonkhet and Supreme Will from Hour of Devastation. These guys are so badass, and they do a lot for five mana. A 4/4 can jump in the way of most threats in Hour of Devastation and Amonkhet. Vigilance, meaning it doesn't tap when they attack, makes it a perfect offensive card while the Reach, meaning it can block flyers, makes it a perfect defensive card. This can stabilize a board with little to no effort, and even the flavor is a lot of fun. I want to learn more about these guys than I do the Gatewatch. Take Bitterbow Sharpshooters once all of the bombs and higher end Uncommons can be scooped up. Really solid common, especially in a Green deck that ramps. 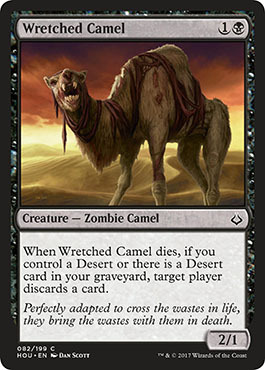 Wretched Camel is a bit of an overperformer. Not many thought much about this card when we first saw him, but now that Deserts have been established as something that you will use pretty frequently, his additional ability makes him pretty solid in a pinch. Imagine this. You play this camel on turn two and attack with him as a 2/1 on turn three. It's no loss to you if he trades with another creature, but it's a huge loss to an opponent if they lose a blocker and/or have to discard a card for killing him. Naturally, they'll let him through two or three times before finally realizing that they have to take care of him because the damage is piling up. Maybe by that time, they'll have played all the useful cards in their hand, so his ability won't be as important. Even so, he still managed to deal 4 or 6 damage, which is respectable for a 2-drop. Plus, being a zombie makes him relevant in a zombie deck. Another late pick common card, one you'll use but not be proud of. 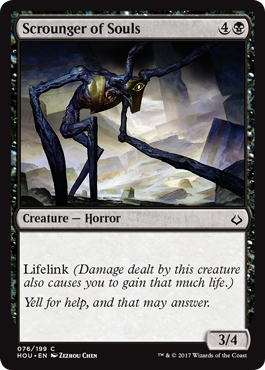 3/4 with Lifelike, meaning you gain life for each point of damage he deals, is effective, especially against aggro decks with tiny White and Red creatures. However, the five mana is a killer. Once he comes into the battlefield, those little Red and White creatures have already bashed you down to the point of death and those that aren't eaten by him will cancel out the lifegain he gets you back. Scrounger of Souls is filler at best. LAME! 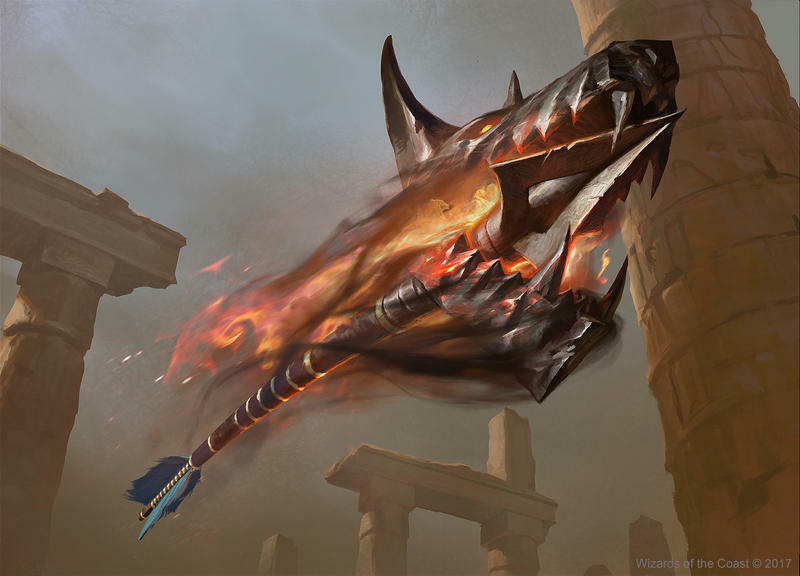 Hekma Sentinels was a solid card from Amonkhet with a similar ability, but the +1/+1 he received from discarding or cycling meant that he would be able to both kill unsuspecting attackers AND survive. Cunning Survivor only gets +1/+0, meaning that he'll only be able to kill an attacking or blocking creature. He won't likely survive, though. Pushing damage, being aggro… as Blue? Well, it's not totally unheard of, but there are better cards for it than this. I lost so hard to his card, and it's another one that is overperforming. This stopped my Red and White aggro deck in its tracks, and Afflict was the only ability that will save you (because it didn't save me.) On top of shutting down aggro decks, these get to hit you for a point of damage every turn if you have a Desert (again, like you should). Now, imagine facing down two or three of these at once. Your tiny creatures become useless unless they gain flying, and even then, you're getting pummeled for three damage that can't be stopped every single turn. That piles up faster than you think. Our sole Desert in the pack, and it's a good one. This is essential if you want to play a third or even fourth color in your deck. I've seen this fix a mana base with no problems, dropping bomb after bomb, and the player didn't even drop a sweat hoping that he would be able to deliver his deck's full potential. 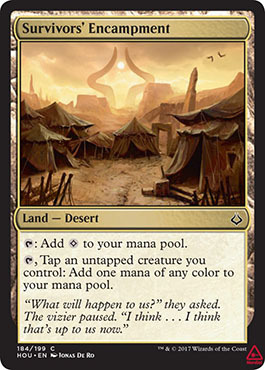 It's a really solid land card, and the fact that it's a Desert just makes it better. Take it halfway through a Draft, and definitely use it in Sealed if you need to splash for a third, fourth, or even fifth color. 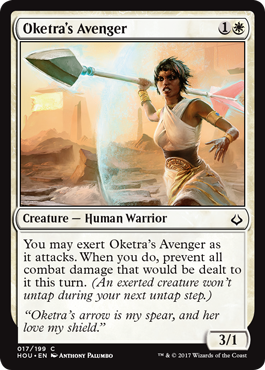 Once again, we run into Oketra's Avenger, and once again, she's one of the best commons in the pack. I'd still take Open Fire over her, but jamming in with a creature who can't be killed every other turn for three damage is something that will drive your opponents crazy. I'd choose this over Rares and Uncommons if my Draft was heading in an aggressive direction, and I would use it to establish myself in an aggro deck as well, hoping for one or two more down the road. The fact that this is common is just silly. 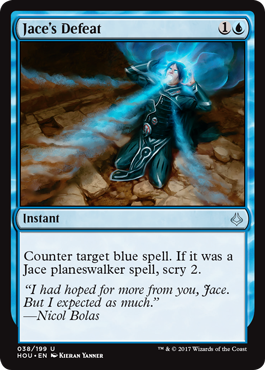 Once again, the Defeat cards are all solid (except for Nissa's Defeat), but Jace's is the weakest of the playable ones. 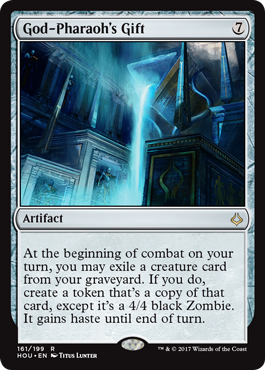 Counterspells in Draft and Sealed don't get it done as efficiently as you'd like, and this one is only limited to Blue spells, meaning it goes in your sideboard at best. 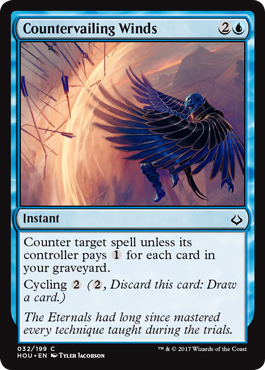 It's much better as a sideboard card in Standard and Constructed, where it should have no trouble tearing up opposing mirror Blue decks. Man, if only our Green and Blue cards were stronger. 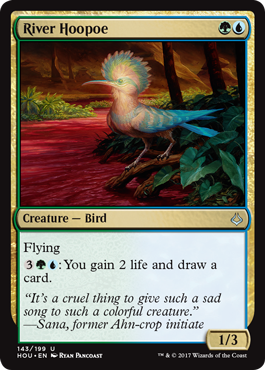 River Hoopoe (pronounced "hoo-poo") is a really solid Magic card. The 3-toughness and flying make him a legit early blocker, and the ability to gain life and draw cards off of him means he's valuable in the late game, as well. Being two colors makes him a hard sell as a first pick, but if you picked a solid Blue or Green first or are able to splash for a third color by pack two, he's a pick you want. Maybe second, third, or fourth selection in a draft. 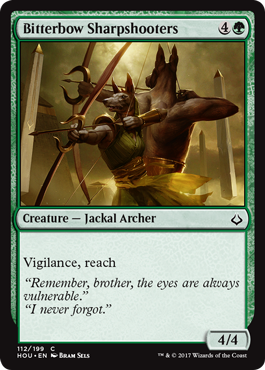 Never first, especially in this pack with Oketra's Avenger and Open Fire wide open. 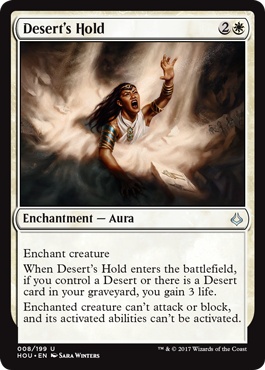 Desert's Hold is about as strong as White removal gets. Three mana, exile a creature. Clean, efficient, no problem. The added bonus of playing Deserts (LIKE YOU SHOULD BE DOING!!) is just frosting on top of a really powerful spell. Who would say "No" to three life? I wouldn't. In constructed, I don't see this working out. Statis Snare from Battle for Zendikar is technically harder to cast, but it has Flash, meaning it can come down and crush a creature at instant speed. Huge advantage over Desert's Hold there! Cast Out from Amonkhet is also better. It also has Flash for a casting cost of four mana, but you can also cheaply Cycle it and draw a card if you have no use for it. This rare is a bomb if you can build around it. Bring along lots of cheap creatures to block and feed into your graveyard and lots of removal spells to stall your opponent. Do anything you can do to get to seven mana. Once this comes out, your 4/4 zombies will build you an army worthy of Mordor! I'll talk Sealed first because it's obvious that if I open this pack first, I'm clearly on the way to a low-curve, aggressive White and Red deck. 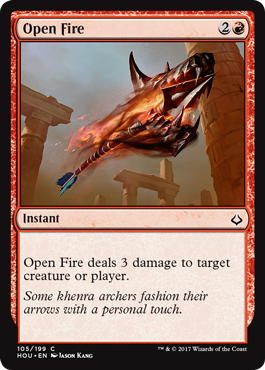 Open Fire, Oketra's Avenger, and Desert's Hold would likely make the cut there, and I'd play God-Pharaoh's Gift if I needed another playable after opening the rest of the packs. Outside of that, this is a pretty weak pack with only River Hoopoe and Bitterbow Sharpshooters exciting me. A Blue and Green ramp deck might be possible with these two cards, and teaming ramp cards up with God-Pharaoh's Gift will only help it come out faster. Now for the Draft. If this was my first pick, it comes down to Desert's Hold and Open Fire. Both are even in terms of effectiveness with Desert's Hold shining in a long game and Open Fire being more powerful in a fast game. However, the Oketra's Avenger in the pack is getting passed no matter what, meaning my neighbor might want to start taking White cards if he sees it and any others that I pass in future choices. If that's the case, I might find myself fighting with him over White cards in the second pack. Taking the Red card and passing all the White could mean you'll be the only person in your vicinity taking Red. Or you can just take God-Pharaoh's Gift and keep yourself open to any color that comes. 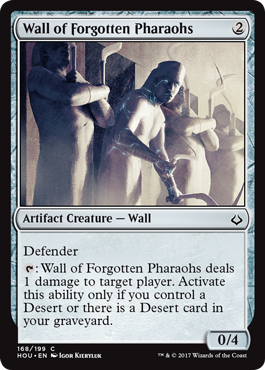 Artifacts are usually good for that, but this choice also limits the style of decks you can make, where as Desert's Hold and Open Fire fit into any deck. Yeah, Open Fire is my first pick here, but it's close.